Coach Robert Gordon watched Dieker in the offseason during a camp workout and liked what he saw including his leadership skills. Dieker has size at 6-5, 235 and his resume is impressive having Arena Football League experience. Knowing how to communicate with players who might speak a different language is a plus as Dieker helped the Beijing Lions to the China Bowl Championship last season. The 6’5”, 235 pounder had the most rushing attempts for his team last season with 19 carries for 59 yards and four touchdowns. He also caught 12 passes for 123 yards and four scores while completing five of seven passes for 68 yards and two touchdowns without an interception. 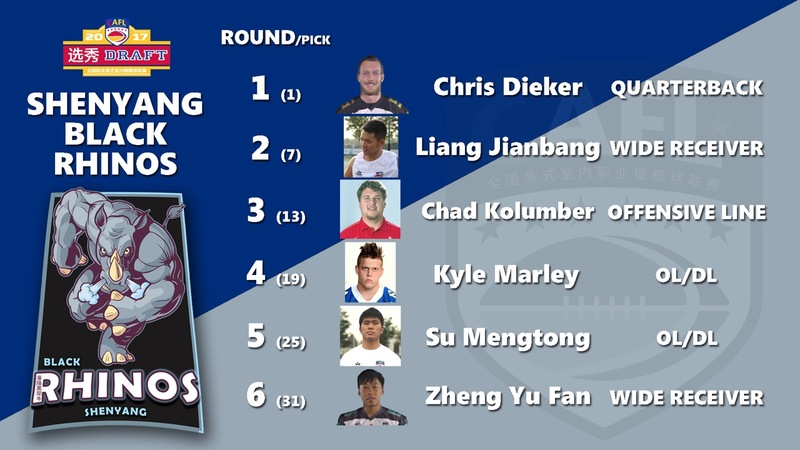 Dieker became the only player in CAFL history to record touchdowns rushing, passing and receiving in the same game and helped the Lions to the China Bowl title over Qingdao with nine receptions for 107 yards and a touchdown in the championship game. Coach Gordon saw Liang at the Shanghai combine and noticed his speed. He will be looking to fill the roster spot vacated by Ka Chung Yip who had just two receptions for 15 yards last season. At 6-7, 350, the native of Norristown, PA will add much needed size and experience to a revamped offensive line. In 2015 Kolumber played in the FXFL Florida and Hudson Valley. 2016 saw him in the IFL Iowa and this past season with the Colorado. Coach Gordon is also impressed of his knowledge of the game as someday Kolumber would like to coach. Helping his new teammates to understand the finer points of the game is a great way to start. Marley was one of the stand outs at the CAFL combine in Austin, Texas. Scouts liked the way he moved well for his size at 6-5, 330. His times were impressive as he ran the 40 yard dash in 4.9 and his pro agility shuttle in 4.8. Marley dominated pass rushers in his tryout and showed great technique. A product of Southeastern Oklahoma State University, Marley has played with the Texas Revolution in the Champions Indoor Football league. Coach Gordon liked Su’s size and footwork coming out of the Shanghai combine. He will have a great chance to make the roster with the release of lineman San Zhi Qu. Fan was released at the end of the season when the Dalian Dragon Kings pulled up stakes are moved to Shenyang but new Head Coach Robert Gordon kept an eye on the former 12th round pick as he continued his workouts. Gordon decided to give the 5-8, 187 Shanghai University of Engineering and Technology graduate another shot and took him the in the sixth round, making Fan the first player in league history to be drafted twice by the same franchise. Fan’s next catch would be his first in the CAFL. Fan hopes to continue to continue to grow the sport of football in China seeing unity and courage in a game which challenges the spirit of the youth in his country.